"The eighth [FALCONER] album, 'Black Moon Rising', is finally written. "In January, we will once again enter Sonic Train studio [in Vargerg, Sweden] with [producer and KING DIAMOND guitarist] Andy La Rocque. "Release date is set to June 2014. "This time we have even made some preproductions of the material to test it out in advance. Some titles are: 'There's A Crow On The Barrow', 'Age Of Runes', 'Scoundrel' and 'The Squire'. "As said before, all songs are in English this time after the last album's one-off with only Swedish songs. "It's for sure the most riff-based album in many years, and there are certainly some furious moments of brow raising on the album. "If I would sum up the material with two words, they would be intensity and revitalization. "We will keep it quite basic with no guest musicians and allmost no keyboards to keep it raw, natural and unpretentious. "Can't wait to enter the studio and put the finishing touches on the songs!! FALCONER's seventh album, "Armod", was released in June 2011 via Metal Blade Records. 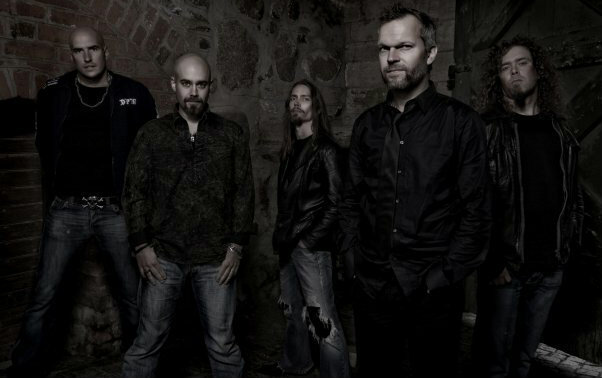 The CD featured 11 songs completely sung in Swedish and four bonus tracks that were said to be English versions of the bandmembers' favorite new songs. "Armod" was once again recorded at KING DIAMOND guitarist Andy La Rocque's Sonic Train Studios in Varberg, Sweden during December 2010 and January 2011.